That moment when you are so passionate about capturing emotions and those images that your wedding clients will cherish forever. 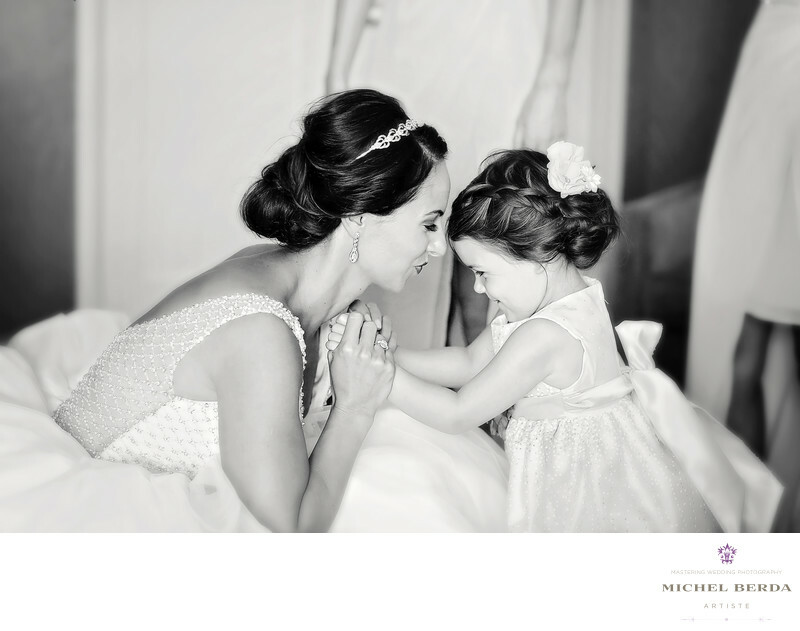 How cute and priceless is this image that I captured The Westin Hilton Head Island Resort & Spa in the bridal suite of the bride with this special flower girl? Being ready and prepared for any situation is what makes your wedding photography shine. Most of us wedding photographers consider our self to be photojournalistic what is that meaning, does it really apply to what we do or should we come out with a new meaning like photoweddingistic. Do most of us pay attention to the surrounding of where we are at that specific moment. I always let the moment happen and look for these in creating a compelling wedding image. To me, all of my clients deserve excellent artistic wedding photography, and therefore it takes hard work, a style in creating those images, a huge knowledge of my equipment. Being familiar with a venue can also have its advantages and therefore in this situation at The Westin Hilton Head Island Resort & Spa since I have captured many weddings at this beautiful venue, I already knew the lighting situation in the bridal suite. I love this image it almost feels real because there is such a great connection between the bride and the flower girl. Keywords: grand ocean terrace (3), grand ocean terrace hilton head sc (3), grand ocean terrace The Westin Hilton Head Island Resort & Spa (3), hilton head isalnd wedding photography (3), hilton head weddings (3), Michel Berda (1140), photographer (1125), The Westin Hilton Head Island Resort & Spa (9), The Westin Hilton Head Island Resort & Spa wedding photographer (3), wedding photographer hilton head sc (6), wedding photographer The Westin Hilton Head Island Resort & Spa (3), weddings in Hilton Head SC (6).